The smiling, peaceful face of the woman in the above photo is actually a death mask, cast from her face . The story goes that the body of a girl around 16 years old was pulled from the Seine River in France in the late 1880s. It was suspected that she drowned herself. According to the story, a pathologist saw her body on display at the morgue and was so enchanted by the corpse’s beauty that he felt it must be preserved, and so created a death mask of her face. There are doubts as to whether the mask was indeed taken from a dead body, due to the unusual facial expression. Another story states that the mask was made by a German mask manufacturer using his living daughter’s face. Whichever story is true, numerous copies of the mask were produced and it became fashionable for Parisian artists to have one in their homes. She was called L’Inconnue de la Seine, “The Unknown Woman of the Seine” and was famed for her beauty. 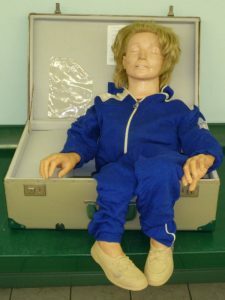 If you ever learned CPR, you may have used a Rescusci Anne dummy as practice. Dubbed “the most kissed woman in the world,” she was the first CPR dummy created. 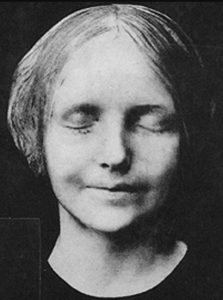 Her face was supposedly based on L’Inconnue after the toymaker who created her saw one of the death masks at his father’s house.